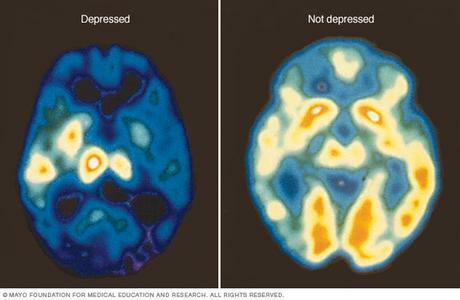 How Does TMS Treat Depression? WE ACCEPT INSURANCE AND WORK WITH MOST CARRIERS. IN ADDITION, WE HAVE FLEXIBLE PAYMENT OPTIONS. 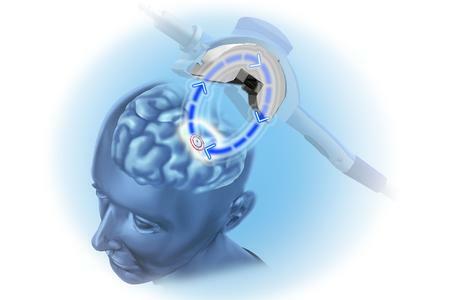 TMS, which stands for transcranial magnetic stimulation, is a form of neuromodulation that utilizes a pulsing magnetic field to induce electrical current. This innovative psychiatric treatment utilizes Faraday’s law of electromagnetic induction, such that a magnetic field is produced by passing electric current through a wire coil (Horvath et al., 2011). When placed against the scalp, current from the magnet passes through the skull and electrically stimulates neurons directly beneath it. This electrical stimulation, when tuned to a high enough frequency of more than 10 Hz, results in depolarization, or excitation of nerve cells, causing them to fire at an increased rate. Increased neuronal firing in turn modulates connectivity and activates pathways involved in mood regulation. TMS received FDA approval for the treatment of major depression in 2008, and it is recommended by the American Psychiatric Association. 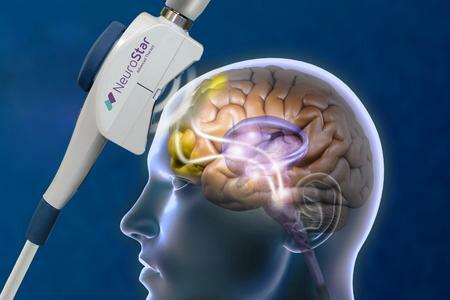 In patients with major depressive disorder, daily, repetitive TMS works to induce long-term activation of nerve cells that are otherwise underactive. We welcome local as well as international clients. Located near Carnegie Hall and Columbus Circle, our location offers proximity to top of the line hotels and accommodations. Clients will have access to New York’s numerous attractions while receiving treatment. 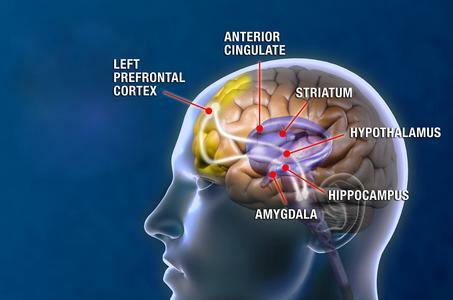 Decades of clinical research support the idea that in patients with major depressive disorder, the left dorsolateral prefrontal cortex is hypoactive (or less active relative to control). Thus, TMS treatment involves placing the magnet on the head so as to target this region in a precise manner, allowing for the reversal of this underactivity and therefore, alleviation of depressive symptoms. 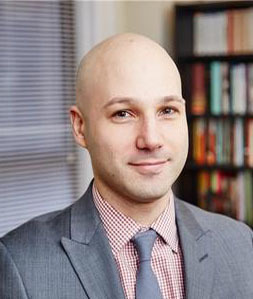 The dorsolateral prefrontal cortex, which is the area being targeted during TMS treatment, is implicated in functions such as cognitive control, working memory, and motivation. Furthermore, the DLPFC is involved in modulating other areas of the default mode network, including cingulate cortex and parietal areas, as well as areas within the limbic system, responsible for emotional response and memory consolidation, such as the amygdala and hippocampus. The standard treatment protocol involves 36 sessions daily, administered over 4 – 6 weeks. TMS treatments are done five times a week from Monday to Friday. Each session ranges from 20 minutes to one hour. Treatment parameters, which are determined during the initial appointment, are tailored to each individual patient and modified across the treatment course as needed. What can you expect during your TMS appointment? During treatment, patients sit comfortably in a reclining chair, and a magnetic coil is gently placed against the left side of their scalp. Each treatment session ranges from 20 minutes to one hour. During sessions, patients can chat, watch television, or listen to music. Patients will hear a clicking noise, but they do not typically feel pain or discomfort. Patients are awake, and there is no use of anesthesia. TMS produces few to no side effects. Some patients may experience a mild headache and slight tenderness in the treatment area over the first few sessions, but this can easily be addressed with over-the-counter Advil or Tylenol.